1. Chutneys, Fruit Pastes and Mostardas, a discussion and tasting of fruit-based cheese accompaniments will be held on Wednesday, March 30, 6:30-8:30 p.m., at Murray's Cheese Shop, 254 Bleecker Street, between 6th and 7th Avenues. $45/person (212.243.3289, ext. 25). 2. Apicius: A New Take on An Old Book, Roman food expert Sally Grainger and Dr. Chris Grocock, Latin scholar, will discuss a new translation of Apicius’ first century De Re Coquinaria, considered to be the oldest known cookbook, presented by the Culinary Historians of New York, Thursday, March 31, 5:45 p.m reception/7:00 p.m. lecture, at the New York Academy of Medicine, 1216 Fifth Avenue. $30/person (212.334.1061). 3. Everything Vanilla, a cooking demonstration/class on cooking with vanilla, from making panna cotta to sour cream pound cake and other recipes, will be held on Thursday, March 31, 7:30 p.m., at The Art of Cooking, 555 Hudson Street. $55/person (646.831.3729). 4. Springtime for Burgers, after a winter hiatus, Danny Meyer's Shake Shack will reopen for business on Monday, April 4, at 11:00 a.m. Shake Shack is located at Madison Square Park, South East Corner (212.889.6600). 5. Take a Bite Out of the Big Apple, benefit event featuring dishes from Hearth, 360, Savoy, Il Buco, and Mas, to support the Farm to Chef Express program, which supplies products from New York farms to New York City restaurants, Tuesday, April 5, 6:30-8:30 p.m., at the Cornell Club, 6 East 44th Street. $100/person (212.692.1381). 6. Candy Bars and the Birth of the American Spirit, Steve Almond, author of Candyfreak, will discuss his book, candy, and American culture, presented by the Culinary Historians of New York, Tuesday, April 5, 6:30 p.m. reception, 7:00 p.m. presentation, at Dylan’s Candy Bar, 1011 Third Avenue. $30/person (212.334.1061). Eric Ziebold, CityZen, Washington, D.C. According to a press release, the chefs will be featured in the the July 2005 issue of Food & Wine. 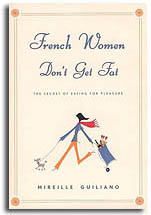 The Morning News has published a roundtable conversation I recently held via email with four French food bloggers to discuss their perspectives on the hugely popular diet book French Women Don't Get Fat, the "French paradox," and the similarities and differences between French and American food cultures. I would like to thank Requia Badr of Chez Requia, Clotilde Dusoulier of Chocolate & Zucchini, Estelle Tracy of Le hamburger et le croissant, and Pascale Weeks of C'est moi qui l'ai fait, for their thoughtful contributions to this discussion. I seem to be on a citrus kick lately. I can only explain it as a physical manifestation of my mind's frustration with this endless winter. While I'm still working through my blood orange bounty from last week, thanks to suggestions in the comments, I'm inspired to venture into sour orange territory soon, whether to make sour orange sorbet or cochinita pibil. But first, a break from oranges for some more citrus: grapefruit. The first time I had San Pellegrino Pompelmo, a fantastic grapefruit soda, was in Italy, and I have not seen it in stores in New York City until my recent visit to Agata & Valentina for the blood oranges. I returned there yesterday and brought home a bottle. 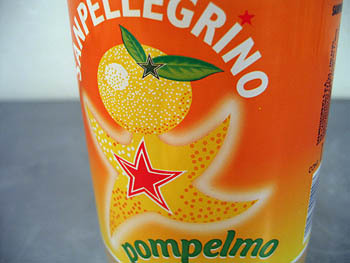 Like San Pellegrino's Aranciata and Limonata sodas, Pompelmo is infused with a heavy dose of real fruit juice and pulp (12 percent of the volume, according to the label). If you like grapefruit, you'll love this soda. Very lightly carbonated, it bears the color of white grapefruit and has the refreshing, bittersweet taste of the real thing. San Pellegrino Pompelmo is $3.49 for a 1.5 liter bottle at Agata & Valentina, 1505 First Avenue at 79th Street (212.452.0690). » Who knew that San Pellegrino is owned by Nestlé? » San Pellegrino history and timeline (1250 to the present). 1. Horticultural Lecture Series: Fresh Food from the Garden, Wave Hill will present a lecture by farmer, author, agricultural researcher, and educator Eliot Coleman on small-scale organic farming and sustainable agriculture, Wednesday, March 23, 6:30 p.m., at the New York School of Interior Design, 170 East 70th Street. $20/person, $17/Wave Hill members (718.549.3200, ext. 216, for reservations). 2. Why Grass is Best - and We Don't Mean Tennis or Smoking, Nina Planck, former Director of Greenmarket and author of the Farmers' Market Cookbook will discuss the benefits of "beef, lamb, poultry, milk, eggs, and butter raised on fresh green grass," followed by a tasting, Wednesday, March 23, 6:30 to 8:30 p.m., at Murray's Cheese Shop, 254 Bleecker Street, between 6th and 7th Avenues. $35/person (212.243.3289, ext. 25). 3. All American Wine from Coast to Coast, a discussion and tasting of wines born in the U.S.A., Wednesday, March 23, 7:00 to 9:00 p.m., at the Institute of Culinary Education, 50 West 23rd Street. $70/person (212.847.0770). 4. Northeast Farmstead and Raw Milk Cheese: Back to the Future Discussions and Guided Tasting, The Baum Forum will hold a discussion on artisanal cheese-making, including a tasting, Saturday, March 26, 10:00 a.m. to 2:00 p.m., at The Graduate Center (CUNY), 365 Fifth Avenue (at 34th Street). 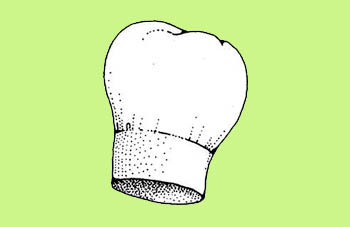 $25/person, $20/students and Slow Food members (718.884.5716). On the left, weighing in at 6 ounces, is a Sunkist blood orange grown in California. 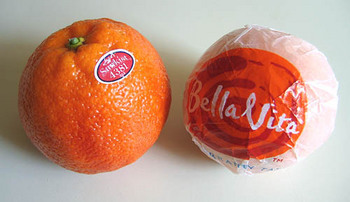 On the right, weighing in at 7 ounces and sporting a paper wrapper, is a Bella Vita blood orange hailing from Sicily. Both were purchased at Agata & Valentina on New York's Upper East Side. Aside from their state of dress (or lack thereof in the case of the Californian), both oranges look pretty similar on the surface. However, when sliced, they reveal their differences. The California orange bears a thick skin, slightly dry flesh, and deep, dark ruby red color, while its thin-skinned, juicier, and sweeter Sicilian cousin resembles a typical orange marbled with more saturated orange tones resembling, dare I say, saffron. Both taste great, but I would hand the victory to the Californian in delivering on the visual promise of its moniker. 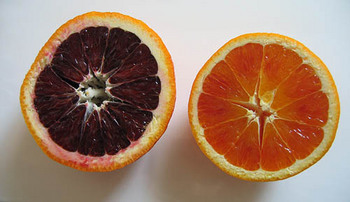 I was surprised at the difference between these blood oranges, particularly since this New York magazine article describes Sicilian blood oranges as having flesh "so dark it’s nearly black." This could not have been farther than the case for my (unscientific) sample, but, who knows when it comes to fruits and vegetables? Perhaps on a return visit or a trip to another store, I would find a batch of Sicilian blood oranges as dark as the Californian ones I picked up this week. I made the most of my international blood orange supply, and against chef Jody Williams's wishes, I prepared her Insalata D’arancia using both varieties. 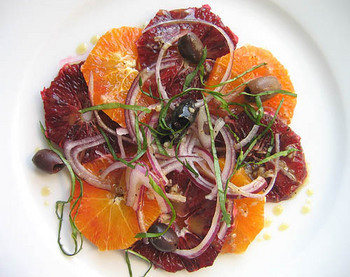 The salad is fantastic and easy to prepare: sweet from the oranges, salty from the anchovies and olives, and crunchy from the onions, not to mention lovely to look at. Make it now as a protest against this neverending winter. California blood oranges and Sicilian blood oranges are both $2.99 per pound at Agata & Valentina, 1505 First Avenue at 79th Street (212.452.0690). 1. The World Chocolate Show: An International Chocolate Extravaganza, for those who can't wait for the November Chocolate Show, the 92nd Street Y will present this preview and tasting event, Wednesday, March 16, 7:00 p.m., at the 92nd Street Y, 92nd Street at Lexington Avenue. $45/person (212.415.5500). 2. Wine Century Club Dinner and Wine Tasting, inaugural five-course dinner of the Wine Century Club, "a new organization devoted to oenophiles who’ve tried at least 100 different grape varieties," Wednesday, March 16, 7:00 p.m., at Lo Scalco, 313 Church Street. $95/person (917.348.3999). 3. A Sharp Way to Fight Hunger! Get your knives sharpened and support City Harvest at the same time, Saturday, March 19, 11:00 a.m. to 5:00 p.m. at Broadway Panhandler, 477 Broome Street. $10/sharpen up to three knives (866-266-5927). 4. Dazzling Tuscan Reds, David Lynch, author and wine director at Babbo, will lead a tasting of Tuscan wines paired with, what else, Tuscan fare, Saturday, March 19, 1:00 to 4:00 p.m., at Macy's De Gustibus, Macy's Herald Square, 151 West 34th Street, 8th floor. $95/person (212.439.1714). 5. Sweet & Savory - Dessert Pairings with Cheese, pastry chef Pichet Ong of Spice Market and 66 will pair desserts with cheese at this discussion and tasting event, Monday, March 21, 6:30 to 8:30 p.m., at Murray's Cheese Shop, 254 Bleecker Street, between 6th and 7th Avenues. $50/person (212.243.3289, ext. 25). 6. Careers in Television - Behind the Set Information, the American Institute of Wine & Food (AIWF) will present a panel discussion on the world of food television, Monday, March 21, 7:00 to 9:00 p.m., at The French Culinary Institute, 462 Broadway. $15/person (718.229.6565). The Food Section (and my recent post on "The Gates" and saffron) is mentioned in today's Washington Post in an article on the world of food weblogs. "Stirring Commentary: A Food Blog for Every Taste" provides an introduction to the food blogging phenomenon and offers a roundup of some of the best food blogs on the web. If you are new to this site, please take a look around and explore past postings (via the archives menu at left) and sign up for The Food Section newsletter to receive site news and updates by email. For an even deeper immersion into the food blog universe, visit the many food blogs listed in the right sidebar (organized under "Metro," "Nation," and "World"), or, even better, head to FoodPornWatch for a constantly updated listing of the latest posts by food blogs across the globe. Wine Century Club Dinner and Wine Tasting, inaugural five-course dinner of the Wine Century Club, "a new organization devoted to oenophiles who’ve tried at least 100 different grape varieties," Wednesday, March 16, 7:00 p.m., at Lo Scalco, 313 Church Street. $95/person (917.348.3999). 1. National Wine Week, sample 10 wines for $10 at lunch at Smith & Wollensky Group restaurants, including Park Avenue Café, Manhattan Ocean Club, Cité, Maloney & Porcelli, and The Post House. The promotion continues through Friday, March 11. 2. 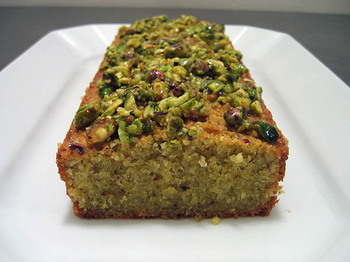 New York City Food, the Culinary Historians of New York will present a lecture by "Food Maven" Arthur Schwartz on New York's gastronomical history, Wednesday, March 9, 6:30 p.m. reception/7:00 p.m. program, at The Mount Vernon Hotel Museum, 421 East 61st Street. Members/$25, guests/$30. Advanced registration only (212.334.1061). 3. Wine Rave NYC, "not a stodgy 'festival' or boring 'expo,' this is a wine tasting event with a laid-back New York vibe," Friday, March 11, 6:00 to 10:00 p.m., and Saturday, March 12, 3:00 to 10:00 p.m., at Metropolitan Pavilion, 125 West 18th Street. $48-$80/person (212.352.9900). 4. Origins of Cheese, Daphne Derven, Director of Program and Development at Stone Barns Center for Food and Agriculture, will discuss the history of cheese-making, Sunday, March 13, 1:00 to 3:00 p.m., at Murray's Cheese Shop, 254 Bleecker Street, between 6th and 7th Avenues. $35/person (212.243.3289, ext. 25). 5. Foodie: Modern Takes on French Classics, a six course tasting event of French-inspired dishes paired with French wines, Sunday, March 13, 5:30 to 9:30 p.m., at Divine Studio, 21 E. 4th Street, Suite 605. $105-$205/person (joe@foodienyc.com).